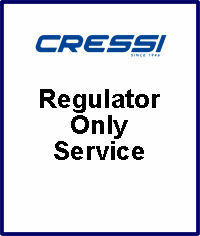 This product is our premier "Collect and Return" offer for regulator servicing. When you purchase this service we will contact you to arrange for your regulator to be collected from your chosen collection address and delivered to our service workshop at Stoney Cove. Once at the workshop your regulator will be stripped to its smallest parts, cleaned and examined. Your regulator will then be rebuilt using genuine manufacturers service parts and then tuned to achieve its optimum performance. It is then worked on a breathing machine to bed the dynamic components after which it is then rested before its final inspection. Once completed your regulator will then be repackaged and returned to your chosen address. Please Note: This product cannot be combined with any other offer and if extra parts are required to return your regulator to a serviceable condition that are not covered by the manufactures service kit, we will contact you for permission to carry on with the extra work and advise you of any additional costs.